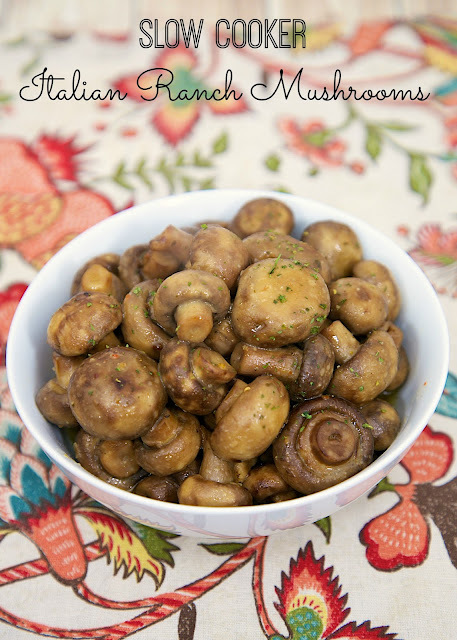 Slow Cooker Italian Ranch Mushrooms - only 4 ingredients! 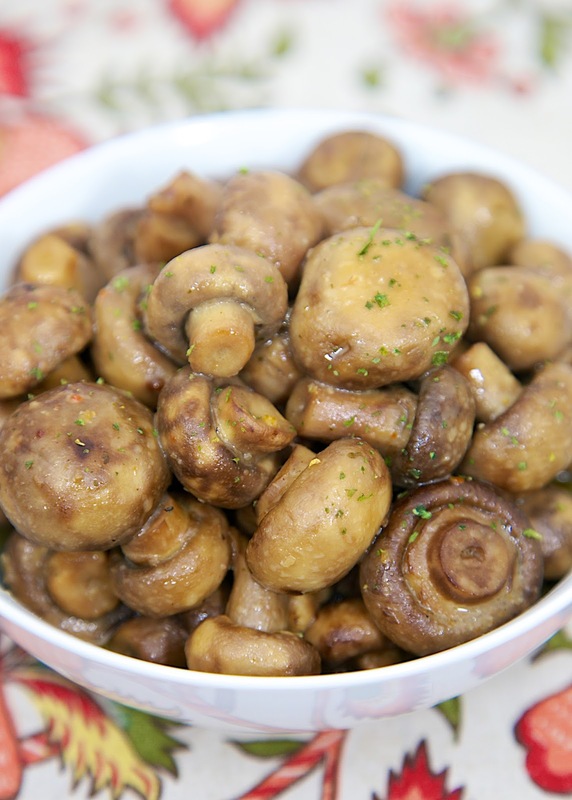 These mushrooms are fantastic!! Great with steaks and grilled meats. Such a simple recipe, but it tastes amazing! We love this easy slow cooker side dish recipe! A few months ago we went to see Alton Brown Live at the BJCC. He was GREAT! He was extremely entertaining. He told stories, sang, and cooked. He performed for over 2 hours. If you are a fan of Good Eats you would be in heaven! It was one of the best shows we've ever seen. During the show, Alton does a bit on "10 things I'm pretty sure I'm sure about food". One of the things on the list that night was to always wash your mushrooms. He said people will tell you not to wash mushrooms. Do you know what mushrooms are grown in? Poop. Yep. Poop. He said that black stuff on the mushrooms isn't dirt, it's poop. SO, always wash your mushrooms!! On to the recipe. These mushrooms were fantastic! They smelled amazing while they were cooking. I loved how easy they were to assemble. There are only 4 ingredients. Mushrooms (washed), Ranch dressing mix, Italian dressing mix and butter. I just dumped everything in the slow cooker a few hours before dinner and we had a fantastic side dish with no work! We served these with some steaks and potato casserole. It was way better than any restaurant meal! Place all ingredients in slow cooker. Toss to coat. Cook on LOW 3 1/2 - 4 hours. These sound really yummy!!!! "Poop" you say....now that is a surprise I have just become convert and will be sure to wash those little guys from now on! Just Pinned! I put this recipe in 'Side Dishes', but I was tempted to put it in 'Appetizers & Nibbles'. Just give me a toothpick and I'm good to go!! They look super good and I always wash mine. These look SO good! I love mushrooms and I'll definitely wash them from now on! What did he say is the best method for washing them? He said to run them under water and scrub the poop off. No need for a special brush or method. I used a dish rag. Yum! My husband is a huge mushroom fan. He is going to love these! I read Alton Brown's mushroom washing advice in one of his cookbooks, but it would be way cooler to hear it in person! Thanks for sharing these yummy recipes! I was admiring your table cloth in this photo- I love the colors and pattern! Can you tell me where you bought it or what the fabric is called? Thanks!! I got the fabric at Pottery Barn a while back.